The Nvidia GeForce RTX 2080 and RTX 2080 Ti might be the flagships of the new Turing set of graphics cards, but their prices keep them out of the reach of most PC gamers. Naturally, we expect the GeForce RTX 2070 will be even more popular as the only graphics card with real-time ray-tracing that’s anywhere close to being reasonably affordable. The xx70 cards of any Nvidia GPU series is defined by mid-range prices with performance that knocks on the door of the high-end GPUs out there – especially if you’re comfortable with overclocking. After taking the time to fully test the Turing graphics card inside the Nvidia GeForce RTX 2070, we can say it definitely continues this trend, but with playable 4K gaming performance and a high asking price. Just like the rest of the Nvidia Turing lineup, the RTX 2070 comes at a substantial premium over its predecessor. The Founders version of the Nvidia GeForce RTX 2070 will set you back a whopping $599 (£569, AU$899). Thankfully, you’ll find many third-party cards at a more palatable $499 (about £380, AU$690) price. Both of which are available to purchase now in the US and UK. For reference, the Founders Edition version of the Nvidia GeForce GTX 1070 Ti and Nvidia Geforce GTX 1070 originally came priced at $449 (£419, AU$759) and $399 (£379, AU$699), respectively. Meanwhile, AMD’s closest equivalent cards are the $499 or £549 (about AU$690) Radeon RX Vega 64 and $399 (£379, AU$679) Radeon RX Vega 56. 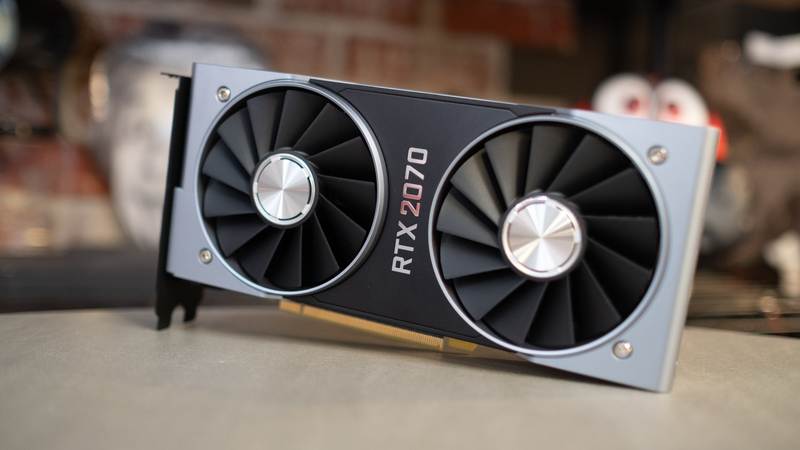 However, we’re sure that there will be some Black Friday and Cyber Monday deals out there that’ll make prices for the RTX 2070 – and other PC components – more palatable. However, there’s no escaping that the Nvidia GeForce RTX 2070 is indeed an expensive graphics card. The Nvidia GeForce RTX 2070 not only looks exciting because it’s the cheapest RTX graphics card you can buy currently, it also packs an impressive transistor count. Spec for spec, this GPU leapfrogs its direct predecessor, the GeForce GTX 1070, by including 20% more CUDA cores and 6Gbps faster GDDR6 video memory. Compared to the GeForce GTX 1070 Ti and GTX 1080, though, Nvidia’s new mid-range graphics card suddenly has a lower stream processor and texture unit count. It also features significantly noticeably fewer Ray Tracing (RT) cores and AI-powered Tensor cores compared to the rest of the Nvidia Turing lineup. However, without any real-world ray tracing or deep learning super-sampling (DLSS) benchmarks, we don’t yet know how well this GPU will handle Nvidia’s latest graphics technologies. Another letdown is that the RTX 2070 doesn’t support pairing multiple GPUs through SLI. Although Nvidia introduced a much higher bandwidth NVLink Bridge connector with Turing, the RTX 2070 doesn’t feature this new connector at all. If you’re looking to do a multi-GPU setup, you’ll have to plunk down more money on a higher-end graphics card from Nvidia. Nvidia’s latest graphics cards have featured surprising performance in 4K gaming, but we weren’t expecting the GeForce RTX 2070 to deliver here. With our GeForce RTX 2070 test bench, we were able to play Strange Brigade and Forza Horizon 4 at a respectable 70 fps to 60 fps, respectively. Destiny 2 was the only game that really gave us any trouble, but frame rates remained in a playable 40 to 70 fps range. Playing all the same titles at QHD (2,560 x 1,440) resolution kept frame rates hovering around 120fps. Lastly, FHD gaming with the RTX 2070 varied wildly between 120 to 220fps. In our synthetic benchmarks, the Nvidia RTX 2070 blows past the GeForce GTX 1070, GTX 1070 TI and GTX 1080. Amazingly, the only thing to give Nvidia’s new mid-range GPU some competition – aside from the GeForce RTX 2080 – is the AMD Radeon Vega RX 64. Sadly, gaming performance wasn’t quite as impressive. Even if the RTX 2070 consistently delivers double digit frame rate increases over the GTX 1070 and GTX 1070 Ti, any other GPU above those – including the RX Vega 64 and Vega 56 – produce almost identical scores. 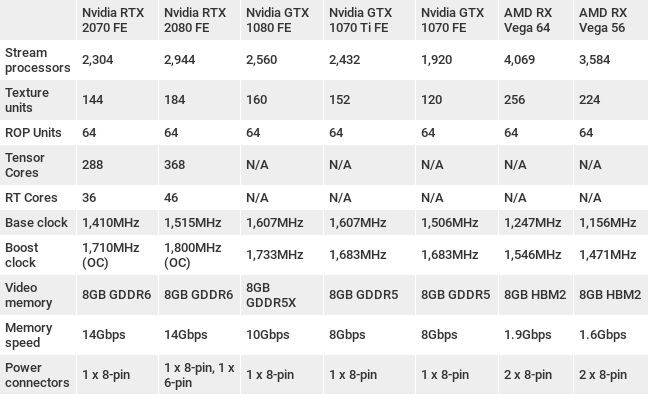 This is all a stark difference from the Nvidia GeForce RTX 2080 Ti and RTX 2080 that delivered such dramatic increases in performance to beat the Nvidia Titan XP. Both of Nvidia’s high-end Turing parts were desirable simply for being the most powerful GPUs. The Nvidia GeForce RTX 2070 is unquestionably an impressive graphics card that puts 4K gaming within reach of a mid-range graphics cards. But with a $499 (about £380, AU$690) price tag, it’s hard to call this GPU affordable, especially with this particular model we reviewed costing an even higher $599 (£569, AU$899) premium. Whether it’s a justifiable upgrade also depends on what graphics card you’re moving up from. Looking at all of our data, users with a Nvidia 1070 Ti or better won’t see a remarkable increase in frame rates after paying more for this GPU. At the same time, those holding onto AMD Vega graphics cards won’t have a reason to jump teams yet. Once again ray tracing and DLSS are the only unique features that the GeForce RTX 2070 offers, but we’ve yet to see how well it will work on this or any Turing GPUs in a real-world scenario. If anything, there are more reasons to hold out on buying the Nvidia GeForce RTX 2070 for now.